n 1914 Heligan in Cornwall was a working country house estate renowned for it’s fabulous gardens. On the outbreak of war, the Squire at Heligan, Mr Tremayne, was also responsible for recruiting soldiers for the Duke of Cornwall’s Light Infantry. Thirteen of his outdoor staff, including gardeners, left and during the war Heligan House, itself, became a convalescent hospital for injured officers. Sadly only four of the outdoor staff were to return. Heligan was not the place it once was and the Squire felt he could no longer live “with the ghosts of the past” and so left to live in Italy. In time, Heligan House was sold off and the gardens became neglected. In 1990 Tim Smit, who had moved to Cornwall from London, was looking for land to breed rare animals. He settled on Heligan and in the clearing of the site they discovered the names of the thirteen outdoor staff who left for war written on the gardner’s outside toilet which they jokingly called “The Thunderbox”. 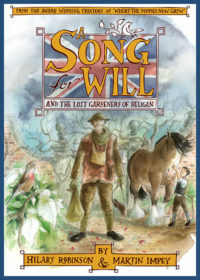 The Lost Gardens of Heligan is now a major tourist attraction and ‘A Song For Will and the Lost Gardeners of Heligan’ is a fictional story based on facts. It was a privilege to work with the Heligan archivist and local historians in the creation of this special story of Remembrance and it also a privilege to return regularly throughout the year to celebrate the book and the beautiful gardens.